We lost Basia to bladder cancer on April 10th, 2016, basically two years after we lost Spenser and Eva. We think she was about eight years-old when we adopted her (we were her fourth home), so we estimate she was right around the age of twenty when she joined her siblings already in Furbaby Heaven. I noticed that she was peeing more frequently. I watched her in the litter box and saw that she was peeing very small amounts as well. After she peed the couch twice, we were really alarmed and knew it was time to bring in the vet. During that exam, even before the X-ray, he said he felt a mass. I immediately started crying because we had lost four furbabies previously, and I just assumed the worst. And I was right to, as she was soon diagnosed with bladder cancer – a type of cancer that is rare, according to my vet. She didn’t see the great oncologist we used for Kip because she was booked solid (she later told us she would have squeezed us in if she had been told we were trying to schedule with her), so we went with our second recommended oncologist. This sucked because their facility was quite a distance away, and who really wants to make a sick cat travel often to a place far away? It just wasn’t ideal. So the chemotherapy didn’t help her. She ended up tinkling in all the spots she napped in. We had her favorite blanket and favorite round bed cover in the wash constantly. We bathed her a lot too in an attempt to keep her clean and to combat the smell, and thankfully she didn’t seem to mind the baths at all. She was just peeing constantly since there was no more room in her bladder due to the mass increasing in size. Towards the end, her numbers were so bad, and they kept her overnight. That didn’t sit right with us because we didn’t want her away from us when we knew we didn’t have much time left with her. Mark didn’t think she’d come home; however, her numbers improved enough for her to come back home. She was with us for about ten more days until she passed away. On that day, she seemed to be doing fine until after her bath. That was when she started shaking, and we could see she was in pain. Mark did the same thing that he did with Spenser – he made me be the bad guy. He couldn’t accept that she needed to be euthanized at that moment; he wanted to wait until the next day when the vet could come to the house. He just didn’t want to let go, and I understand that. But I said we had to take her to our trusted 24/7 emergency vet, so we did. And, as with all situations like this, it was beyond heartbreaking and sad. Mark held her in his arms as we said goodbye. Basia was definitely a quiet cat. She kept to herself and didn’t really want to associate with her other siblings. She also didn’t play very much. When she did, she was such a slow, uncoordinated player – and that was so very cute to watch! She did enjoy playing with her tail and chasing bugs, though. She also would stop doing that immediately as soon as one of us tried to get video of it. The fact that we succeeded in recording her chasing her tail once or twice was a total fluke! She didn’t like getting her bum rubbed, so much so that she’d smack, hiss, and throw a kitty hissy fit if we tried. She was very dramatic and would scream if her brothers just walked past her. Speaking of noises, she had the sweetest squeak that I miss hearing. I also miss her little pink nose (outlined in black) and her little pink bunny ears. She loved sleeping under the credenza, in the cat crib, and in her heated round bed! She also enjoyed drinking from the sink and from water fountains. Above all else, Basia loved her daddy and was the world’s best daddy’s girl. She was never happier and more content than when she was right next to him, whether it was sleeping on him, sleeping in his armpit, giving him headbutts, or rubbing her face onto his. She adored Mark. As for me? She didn’t care much about me. In fact, she slept with me maybe four times total. She did become more tolerant of me and became nicer to me in her last year or so which warmed my heart. In her last few months while ill, she started this thing where she’d come upstairs to sit on the green cat yoga mat and wait for me to see her so I’d give her treats. She started out by doing this once an afternoon, and sometimes it ended up happening three times an afternoon. Even though it was hard for me to get out of bed, I enjoyed sharing this little routine with her. 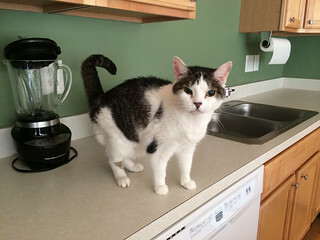 It’s strange to not have her hanging out on the kitchen counters like she always would. It’s all so sad and strange when they’re not here anymore. But she’s with a bunch of her other siblings now, so I know she’s okay. She never had the chance to meet Becca, but I’m 100% positive that those two gentle, old ladies are hanging out together nonstop. We will miss you always, girlie!